There’s a scene in Adam Roberts’ Yellow Blue Tibia in which the narrator, Konstantin Skvorecky, is interrogated by a junior member of the KGB. It’s your archetypical interrogation set-up: windowless room, tape recorder, table and two chairs. During the course of the questioning, the seemingly polite and considerate interrogator will reach across the desk, pause the recorder, and subsequently launch an abusive tirade of threats at Skvorecky, paying particularly gruesome attention to the protagonist’s balls. He’ll then un-pause the recorder and pursue his inquiry in the aforementioned polite and courteous manner, only, of course, to stop the tape machine again and make progressively more disturbing and violent threats of injury to Skvorecky’s testicles. The scene progresses in this manner for a number of pages until, in a hilarious switcheroo, it’s revealed that the KGB officer has been unintentionally recording the “stuff about balls” but pausing the tape while conducting the interview proper. It’s very funny (and nothing I can write in this review could possibly articulate quite how ball-obsessed this KGB guy is); but as well as serving to bathetically undermine the seriousness of the interrogation scene as over-used genre trope, this sketch also functions as microcosm for the entire novel. Yellow Blue Tibia essentially examines the tensions between state-sanctioned truths and the deeper, behind-the-scenes, capital-T Truth (while asking the question: can such a thing be said to exist anyway?). As this interrogation scene pertinently demonstrates, there’s often a gap between the history as it’s recorded and it’s wider, un-written contexts. The book’s key thematic elements are the narrative problems of memory and the recording of the same, and the reconciliation of different characters’ conflicting subjective interpretations of the same events. It’s the kind of thematic fodder that you might expect from more mainstream literary fiction; but don’t worry, Yellow Blue Tibia doesn’t skew quite as close to such middle-brow bore-fests as The Sense of an Ending as I’ve perhaps made it sound. One of the key questions Yellow Blue Tibia attempts to address is this: what, exactly, is science fiction, and, then, what, exactly, is science fiction for? Fittingly for a book that examines truth, openness and the problems of definition, the setting is Perestroika era Russia. Oh, and there’s loads of stuff about UFOs too. Lots and lots of UFOs. In brief: A group of renowned Russian sci-fi writers put their heads together to produce a collectively authored alien invasion yarn on the orders of none other than Mr Stalin himself, who feels that a new enemy is just what Russia needs to unite its people. Not long into the creative process, the writers are ordered to abandon their efforts and, on pain of death, never speak of their narrative again. Jump-cut forty years to 1980s Moscow, where one of the writers, Konstantin Skvorecky, now an elderly divorced ex-alcoholic, is working as a Russian-English translator. Just as Gorbachev is having his way with Communism, the alien invasion that Skvorecky and colleagues cooked-up all those years ago begins to transpire for real. Or maybe it doesn’t. Of course, any book that takes as its subject the nature of truth and the trouble with definition presents some particular difficulties for the reviewer (i.e me). Whether or not I label Yellow Blue Tibia as predominantly realist fiction psycho-drama or escapist sci-fi is somewhat dependent on my own interpretation of its events. In reading, the novel offers a kind of genre mashup: equal parts literary realism, sci-fi novel, historical fiction, thriller, and satire. All of this is perennially augmented(/problematised) by the narrator, who will frequently refuse to commit himself to any one version of events, a feat he achieves by constantly employing the book’s defining refrain: “It was [x]; or it was [y]; or it was some third thing”. So, is there an alien invasion in Yellow Blue Tibia or is there not? (or is there some “third thing?”). Well, refreshingly, the text doesn’t encourage the reader to plant a flag and take sides with either the ‘yes’ or the ‘no’ camps. Of course our objectivity is somewhat limited by the necessarily biased first-person narration (Skvorecky’s testimony is our only source), but one of Roberts’ most extraordinary achievements is never pushing the balance too far in favour of one interpretation over another. In this regard Skvorecky is a perfect narrator and an effective canvass for reader-sympathy; being a Russian-English translator, Skvorecky, like the reader, also finds himself adrift between two irreconcilable perspectives; held in suspicion by the Russians (surely it’s impossible to learn English without simultaneously appropriating some of the fundamental deep-structures of the capitalist mindset? ), yet not at home with the Americans either (there is a (cold) war on, you know etc.). This dualism transcends the sub-text to characterise the page-by-page style of the book’s narration. Skvorecky’s confusion over the alien invasion (that both is and isn’t happening) is charmingly reflected in his narrative voice, which frequently employs bi-lingual puns, hilarious Russian misunderstandings of 20th Century Americanisms and a charming penchant for both Slavic self-deprecation and American pride and blow-hardedness. 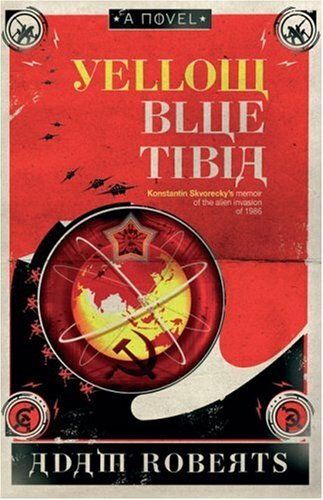 Yellow Blue Tibia is a novel of unresolved parities and long-drawn passive conflicts (if you wanted to be reeeally twee about it, you could argue that the book’s overall structure functions as a long-game metaphor for the cold war). Elsewhere the supporting cast fulfil their roles well: the matter-of-fact and aspergic nuclear physicist-turned-taxi-driver Saltykov offers a pleasing comic foil to Skvorecky’s self-indulgent world weariness. American love interest Dora gives a satisfying non-Russian perspective while simultaneously providing Roberts with an excuse to have his narrator explain all of the clever puns he’s making. Trofim is your prototypical Bond villain henchman, whose brief moments of verbal eloquence come only when he’s repeating verbatim the philosophy of his superiors, an affectation counterpointed to great comic effect with his otherwise lumbering stupidity. That Yellow Blue Tibia revels in these kinds of conflicts and ambiguities is what makes the book so special (I also enjoyed the constant and often contradictory attempts to define science fiction, e.g. : “science fiction is a conceptual disorganisation of the familier” etc.) Being the SF nerd that I am, I’m usually pre-disposed to the more fantastical interpretation of any given set of events. But Yellow Blue Tibia almost denies me this readerly choice by making both of it’s possible outcomes a reality: the alien invasion both is and isn’t happening – and while I can’t explain how the writer achieves this without resorting to massive spoilers, suffice to say the ending really is something else. For the immovably cynical among you, Roberts offers an out in the form of an ‘it was all a bump on the head’ possibility, but this is by far the least interesting of the explanations offered up by the text. In a brief end-note, Adam Roberts states that the kernel of the novel was an attempt to reconcile the “seemingly contradictory facts about UFOs: that, on the one hand, they have touched the lives of many millions […] and on the other, that they clearly don’t exist”; but I would posit that Yellow Blue Tibia also carries with it some strikingly more literary connotations, and that Skvorecky’s dilemma (the synchronized existing and not-existing of the book’s aliens) stands as a metaphor for the interpretive pluralism of literary texts – those wildly different readings of books which are, nonetheless, all equally valid. That the book is narrated by a writer, and that the story constantly draws attention to itself as a multi-layered work of fictions within fictions adds further weight to this argument, I feel. I enjoyed the book immensely. Yellow Blue Tibia is about the different ways we read and interpret texts; it’s about the consequences of fictions; or it isn’t. Or maybe it’s some third thing. This entry was posted in Novels, Reviews and tagged Adam Roberts, Yellow Blue Tibia. Bookmark the permalink. Brilliant. I have this book very much on my radar, but it sounds even better than I had realised. Great review. I adored this book – I loved its madness – and the scene where the Ufologists treat him like a prophet (very Python Life of Brian) made me collapse with laughter.